This afternoon Pope Francis visited the Mausoleum of the Fosse Ardeatine in Rome, which houses the tombs of 335 martyrs, who died in the massacre ordered by Hitler in 1944. On his arrival, the Holy Father was received by the Directress of the Mausoleum, and by the Chief Rabbi of Rome, Riccardo Di Segni. The Pope also greeted some members of the National Association of Italian Families Martyrs Fallen for Patriotism (ANFIM), the persons present there and relatives of the victims of the massacre. The Pontiff entered the caves and stayed a moment, praying before the place in which Italian soldiers died, and then he visited the tombs, placing white roses on some of them and praying in silence. 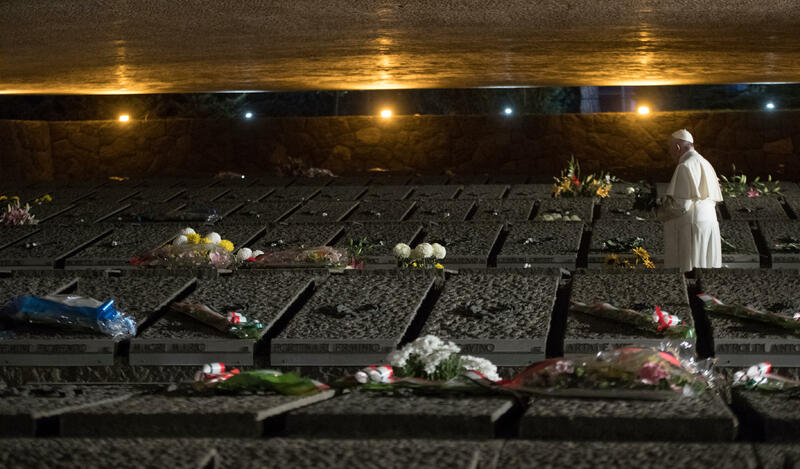 The Mausoleum of the Fosse Ardeatine was created for the perpetual memory of the cruel massacre perpetrated by the Nazis in Rome on March 24, 1944, in the pits of Ardeatina Street. It was inaugurated solemnly in 1949, on the occasion of the fifth anniversary of the massacre. It encompasses in one complex the caves, where the wounded died, the Mausoleum, and the sculptural group, which expresses explicitly the tragedy of the 335 martyrs. Before leaving the area, the Holy Father wrote in the Book of Honor of the Mausoleum of the Fosse Ardeatine: “These are the fruits of war: hatred, death, vengeance . . . Forgive us, Lord. At the end of his visit, the Pontiff returned to the Vatican, where he went to the grotto of the Vatican Basilica for a moment of private prayer, in suffrage for the Supreme Pontiffs buried there and for all the dead.